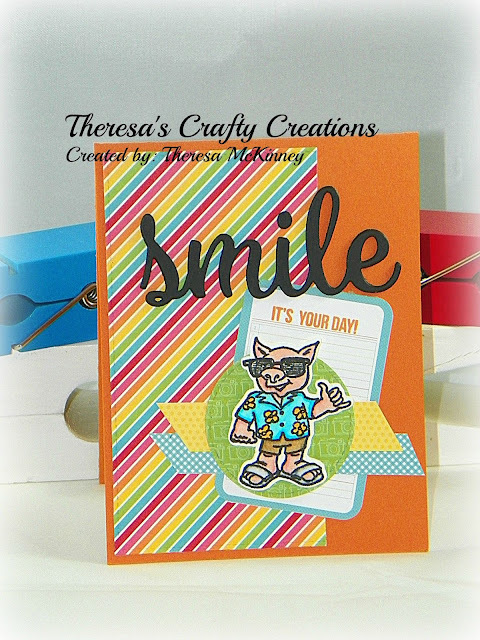 Theresa's Crafty Creations: SMILE... it's your day! Summertime Birthday card with you! How CUTE is that Hang Loose Pig!! OMGOSH!! I just thought he was the coolest EVER! He looks ready to party for the SUMMER! Corner Rounder Punch - We R Memory 1/4"
Cute card!! Love the pig! OMG! I love that card that that pig is just too funny. I hope you are having a great time in Hawaii my friend. Cool, fun and cute!! Awesome card my friend! Adorable card! The little pig is adorable, I love his cool stance! Gorgeous papers you used too! Awww this is adorable! Love that cute little piggy!!! Love the beautiful colors my friend! Have a wonderful weekend! He sure is "some pig!" Love his *Hawaiian* shirt. :) Hope you're having fun! What a super cute card!!! Love that adorable pig and the bright colors!! Fabulous card!! Have a great day. Such a bright, happy FUN card! That little image is really cute, he looks ready for summer! LOL. this is sure one cute card. Love that little pig. Adorable my friend.